Show of hands — how many of you streaming video hounds subscribe to Netflix? 1, 2, 3… okay, well, it’s a lot. In fact, you could say if there was one ultimate streaming video content provider to beat, it’s Netflix. 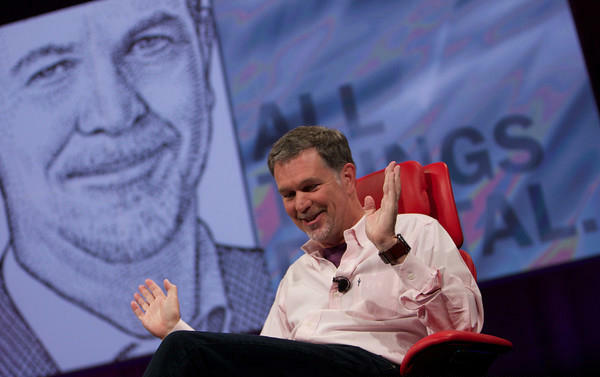 CEO Reed Hastings sure would appreciate it if you said that. Then again, he pretty much said it himself in his quarterly shareholder letter. While the chief exec offered tidbits, like the company’s commitment to exploring original productions and openness to providers playing with time slot formats — anyone up for 14-minute sitcoms? — he also couldn’t resist a little gloating. Netflix killed it in Q4 2012, beating Wall Street’s expectations. And just in case anyone was confused as to why, he decided to make it crystal clear: Netflix’s catalog of video content simply spanks the competition. 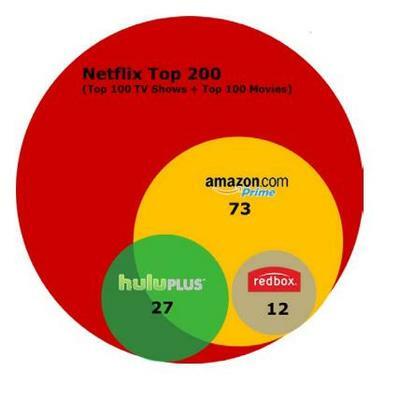 The company wanted to see if Amazon, Hulu and Redbox/Verizon had comparable inventory, so it conducted a survey to find out how many of its most popular programs and films were offered there. Now, Hastings is not usually the type of chief executive to harsh on the competition, and even here, he referenced these services respectfully… right before he whipped out this graphic. Not hard to imagine how gleefully this one was put together. You could almost imagine Hastings making an actual ball out of this — complete with green, khaki and yellow sub-circles — spiking it into the ground and doing a touchdown dance. Why shouldn’t he be happy? His late-breaking decision in 2007 to squash the Netflix Player, a hardware streaming box, to focus on software and content panned out. The box was spun out as the beloved hockey-puck known as Roku, and Netflix marched on to pretty much everywhere — from game consoles, Internet-connected TVs and other streaming boxes (including Roku), as well as phones, tablets, computers and other devices. Content wasn’t the only draw last quarter. Plenty of people got new devices last holiday season, and spiffy new Netflix accounts to go along with them. Netflix announced $945 million for Q4, beating its $876 million from the previous year and topping analyst estimates by $10 million. The news had investors slobbering all over the stock, driving it up 30 percent in after-hours trading. Meanwhile, the company’s DVD business looks like it might be starting to level out. Netflix has been hemmorhaging business in this area, but last quarter, the exodus slowed to just 380,000 lost DVD subscribers. What’s your must-have streaming video service? Is it Netflix or another provider? Let us know in the comments.